Instructor Course: Teach basic lessons, conduct paddle tours, rentals on enclosed flat waters. This is the entry level course for SUP instructors where you provide basic SUP lessons, short SUP paddle tours and SUP rentals in enclosed flat water locations. It covers basic instruction techniques, equipment and operations, planning and conducting SUP sessions, risk management and safely managing groups of students. BONUS: A personal SUP Paddling Video Assessment with review is included in the workshop course, so you can assess your own paddling technique. Plan and conduct basic stand up paddle sessions, short SUP paddle tours and SUP rentals and manage clients safely in enclosed flat water locations. Note: You can enrol in the ASI SUP Rescue and ASI SUP Wise courses at the same time as completing the Level 1 workshop course. If you are not able to demonstrate competent enclosed flat water paddling skills at the workshop, one additional video assessment can be submitted for free. 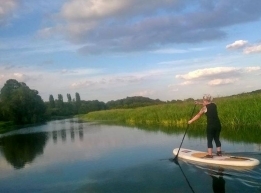 Suitable flat water SUP board to demonstrate enclosed flat water paddling skills.